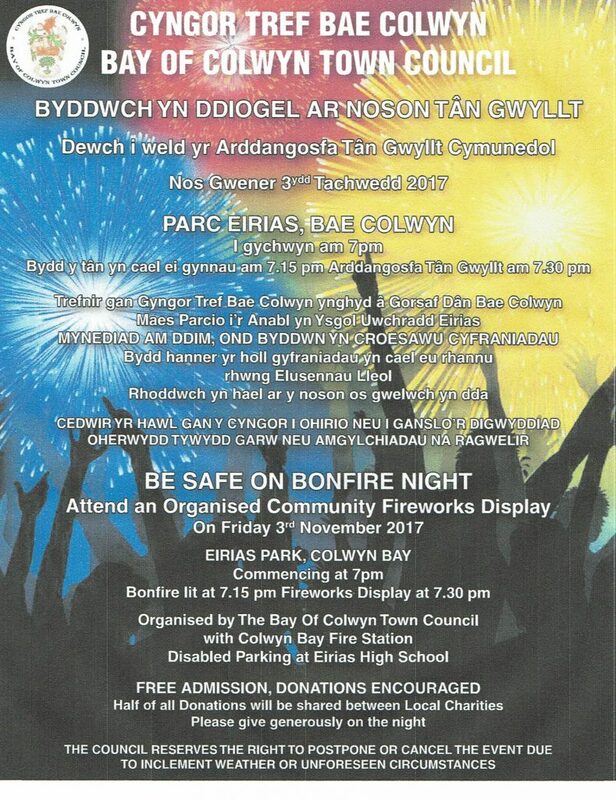 The Bay of Colwyn Town Council, with support from Colwyn Bay Fire Station and Conwy County Borough Council, will be holding its annual Bonfire and Fireworks Event in Eirias Park on Friday 3rd November from 7pm. The bonfire will be lit at around 7.15pm with the fireworks display following at 7.30pm. Free parking is available at the Civic Centre, North Wales Police Headquarters (Abergele Road), Eirias Arena, and the Promenade. Disabled Parking only will be available at Eirias High School. Traffic through the town is expected to be busy so please allow plenty of time to park and walk into the park. Pedestrian entry is via the main park gates, the Civic Centre driveway or the Promenade. A plan of the site showing the main car parks and pedestrian entry and exit routes is attached. Entrance is free, but there will be a cash collection on the night, with 50% being given by the Fire Service to local charities. We would therefore be grateful for your generosity. The event will go ahead whatever the weather (unless we have to call it off on health and safety grounds, e.g. due to strong winds from a southerly direction). Rain will not prevent the event from going ahead. The bonfire will be located outside of the boating lake again this year, due to improvement works carried out on the lake last year. Steps will be taken to mitigate any damage to the grass as soon as possible after the event has taken place and any remaining debris has been cleared. However, the whole site is likely to be affected by the construction works for the new 3G pitch in the park, which is due to commence in November. If you have any queries about this year’s event, please contact the Town Hall on 01492 532248 or at info@colwyn-tc.gov.uk.